The lead in this story is my daughter's school. She doesn't attend the high school in the former GlaxoSmithKline building, though. She attends a Renaissance School in our neighborhood - formerly our local public elementary school, now run by String Theory as a Charter School. To be fair, I love the educational program offered by String Theory, and so does my daughter. She has ballet, creative writing, vocal and instrumental instruction (violin), art, a science lab, and French instruction as "specials", part of an extended day schedule. Or, she had French until last week. Last week one of the two French teachers moved out of town and resigned. It was announced she would not be replaced and instead the students in my daughter's French class would double up on science lab. Other classes will double up on one of the other specials to fill the empty hour per week. I can't help but think that if they weren't paying nearly four thousand dollars per student on the rent, (vs. about $800 dollars per student for the School District) they could afford to hire a new French teacher. My youngest is starting kindergarten next year, and he'll most likely attend String Theory with his big sister. But I'd prefer to not be on pins and needles waiting for the other shoe to drop, as "special" after "special" goes away as more and more operating dollars go to pay off an ill-advised facility purchase instead of going towards what should be the primary goal of any school: educating students. I've always felt, even though my daughter is attending one, that charter schools are a scam intended to funnel public dollars in to private pockets. I think the folks that run String Theory really do have the best interests of the student's at heart, but they've been caught up in the cash grab consultancy surrounding the charter boom. Like every boom, the charter movement is on the cusp of a bust and it looks like my kids will be collateral damage. For profit startup schools with intense surveillance for "R&D" purposes. Former Googler with no education experience? His startup tanked, and his last project at Google was Google+? Yeah, that's confidence inspiring. "If you look at the big picture, you probably wouldn't get out of bed." http://t.co/Sz1DBGyOWZ Another Philly school year starts in crisis. I love the ALS Ice Bucket Challenge. It's wonderful, memorable, and apparently really successful as a fundraiser. But, a friend of mine, Chris Heerschap, pointed out that a one in six Americans go to bed hungry. That's 49 million people, and 16 million of those hungry people are children. I decided that instead of dunking myself with ice water, I'd partake in a Philadelphia tradition and have a water ice, and then add up the cost of a water ice once a week and turn that in to a monthly recurring donation to Philabundance a local food bank. So here it is - the first "wooder ice" challenge. It's not bad enough we do this to ourselves, but when vendors get involved . . . Recently, at the day job, a vendor asked to put a "portal" server, a freebie "value add" for their product, in the DMZ. Said public facing web server would then connect to the Production (!) (Read Only Warehouse, anyone?) Oracle DB inside the secure network. Read only, limited privs to specific views, etc. but nonetheless hitting the production DB, with all of the inherent risks of possible data exposure. But at least that data would be encrypted traffic between the DB and the DMZ Portal server. Except for one thing - the Oracle "Advanced Security" suite is required if you want encrypted listener traffic. And Larry charges something like 25 thousand dollars _per_core_ to purchase it (per server - we have a _lot_ of Oracle servers), plus yearly maintenance. Not going to happen just so one department could implement a freebie add on "customer portal". What about an SSH tunnel, you say? That's exactly what I said. Just start an SSH tunnel, and forward the Oracle traffic via SSH. Secure. And Free! I did a little thinking and settled on whipping up a custom script in Python using the Paramiko library. All in all, probably about a day, maybe a day and a half from first glance to done, including getting the vendor to test. 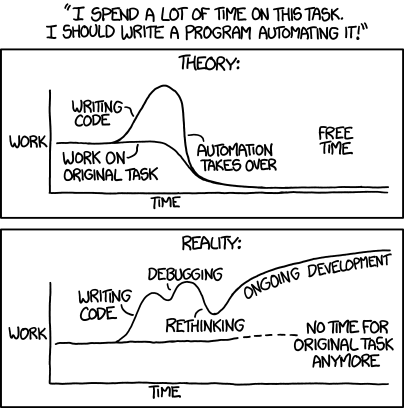 Definitely looks like I've avoided the time sink detailed in the XKCD, right? Well, kinda. That was mid-December. The first week of January Oracle announced they are now bundling several features from the "Advanced Security" suite in to the base RDBMS. Among those features? End to end encryption for listener traffic. 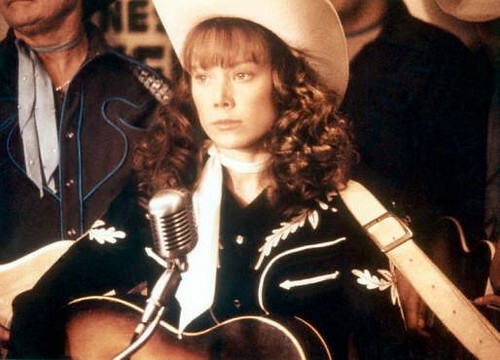 Sissy Spacek in Coal Miner's Daughter, a photo by oscary2008 on Flickr. So today I turn 44. Which means I was 10 years old when this movie premiered. I have to confess I had a bit of a school-boy crush on Sissy Spacek way back then. She was so cute in her ten-gallon hat and bangs. Yesterday I watched the movie Deadfall and Sissy Spacek plays Charlie Hunnam's mom. Sigh. We are all inexorably bending to the will of Father Time. I gotta say, though Ms. Spacek still looks fantastic. Happy Birthday to me. Educate or incarcerate. It's unbelievable how PA can lead in prisons yet fail miserably in education. Or is it?